Some time ago Cardinal Danneels who was the leader of the Catholic Church in Belgium before, acknowledged publicly he was part of some ‘conspiracy group’ within the Church together with other high ranked Church people : the group regularly came together to discuss possible means that could be taken against Pope Paul VI. They didn’t succeed first because against their will it was Benedict XVI that succeeded. The actual Pope indeed was the candidate of this secret group. I understand that he had to follow a secret agenda (coming from this group, as this group wanted more ‘modernity’ and ‘liberty’. After this public acknowledgment (Cardinal Danneels seemed very proud of what he had done), there were rumors on conservative Catholic websites that Benedict XVI had been obliged (by this group) to renounce his function. Some ultra conservative Catholic groups even deny the actual Pope and claim to remain true to the only true Pope (Benedict XVI). They connect the actual Pope with the book of revelation and end time stories. For the moment there are some rumors the actual Pope would resign within a year because the program he was meant to fulfill, has been completed. Again .. this are only rumors. But given the public confession of Danneels himself, it could be there is some truth here .. These old progressive prelates like Danneels, Kasper, &c, really believe in not much at all, except perhaps in the false doctrine of universal reconciliation. For them all questions about doctrine and practice are only relevant for this life and the institutional Church, and it is all a matter of give and take. They seem to be deeply convinced that G’d will always bless what they decide here on earth, whatever it is. One never hears them on such subjects as mortal sin, the possibility to incur eternal damnation, and the necessity of sincere repentance. From what they say and do it is obvious that they are false shepherds and don’t believe in these things. If they did take the Gospel seriously, they wouldn’t consider for a moment to invite adulterers to the Lord’s Table without requiring repentance. before I accepted Yeshua as my lord, I was a catholic: as a child I came out of a catholic family and i was educated a catholic. My parents were very convinced and supported the church. I have known the ‘system’ and only have this memory of a church insitution longing for power: there never was something of even a desire for HaShem. The only places in catholic church I discovered some hunger for HaShem and some faith were in the monasteries that have their focus on prayer. But as you maybe know, traditional monastic orders form a ‘system’ apart from the ‘system. outside. The abbot of a benedictine monastery has the same function and authority of a bishop. He is independant from the local catholic hierarchy. This ads to the difference. The focus is different here. A monastery normally has a different focus than the focus of the local hierarchy outside of a monastery. Furthermore In Belgium – from old a catholic country that the reformation lost in the struggles in the 16 century to the Spanish and the inquisition – the catholic church had always a strong influence in politics because or its connections with the social structures and the political parties (and even the royal family). It is this strong power in the social, educational and medical structures of the country that still guarantees some influence on national and political level. It is not pretty to discover this and experience power in stead of faith. In cases of interest we see a hidden play over people’s lifes without mercy for other thinking people. In my observation and life experience the catholic church never has changed this ‘medieval and ancient’ character trait and if they could, they would take it all back. We see this in their relationships with the other faith families as well. They always act as if they are the master in the game. Even towards muslims and jews. They act as if they know what people have to do in Jerusalem for instance. It is an attitude, an attitude of a master they continuously display. The bishop of Bruges once said me personally (during a visit at the home of my parents one night, while I was still young and studying): the whole thing like oechumene serves only as a thing to get other churches obedient and in one line to Rome again. From that time I knew enough. They will deny this in public, but they never changed concerning their hunger for power and controll. In fact catholic church is about power and controll. Many people that grew up protestants of evangelicals do not know the catholic church from the inside : they only see the surface. They become mislead by this ‘friendly looking’ surface and the manhy rituals. 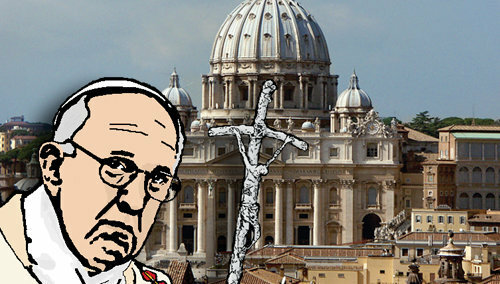 They do not know there is no faith in the church except for some places as some monasteries that do not interfere with politics .. Those mislead people are in danger when engaging in talks with the catholic church about questions as ‘unity’ etc … The official church doctrine is used to get other people within their system and controll. It is a good thing to differentiate between individual catholic people and the ‘system’. This difference ads to the confusion people have. There are ‘individuals’ that do have some faith and they are engaged trying to live out their ‘faith’ but within the ‘system’ they are used. This is something what – for instance – many anglicans do not know, when looking back to the catholic church. I can follow the line of this article. I think you only miss some point in Church history. We must never forget that the Roman Catholic Church presented itself as the center of Christianity after it left the Eastern Church itself, that had its center in Byzantium. The original ‘Christian Church’ was centered in the East and the Catholic Church only presented itself as the original ‘power’ and Church after a power struggle with Byzantium: it didn’t want to submit itself to the original ‘Church leaders’ anymore. They invented a theology therefore (“Tu es Petrus …”). After this break we can speak of two Churches: the ancient Christian faith that we still can find in the Orthodox Church in the East, and the Catholic Church in the West. In theology this break developed further more with the coming of Thomas Aquinas and its theology. In that time there was some conclusion that heathen philosophies in the old times in some way were superior and could be connected with the Lord (such as Platonism etc .. ) and this view opposed strongly the theological views of the Orthodox Church at that time that saw this as heretic. But this development is important because it meant a foundational theological start for further deviation in the future. Many Orthodox Christian believers resist further contacts with Roman Catholics because they see the growing evolution as a confirmation of the original deviation. They also have an analogue view as the Reformation concerning the validity of the Papacy. They see it as heretic and against the will of Yeshua. In their view Western Church history has a logical bottomline, as the Reformation is only the prolongation of deviations and breakings that begun with the original rebellion of the Catholics against Byzantium. They claim their Orthodox faith as being the original unchanged ancient faith of Christianity. Of cause we know that Greek Christianity had its struggle with Judaism and chose for the help of the Emperor in pulling down the original Judaic faith : the Emperor Constantine — still being a heathen at that time — chose for a trinitarian Christianity (through the counsils) hoping to consolidate a universal spiritual culture all over the empire. For him it meant a choice for a cultural political unity and from there for an empowerment of the empire itself. He knew that the old pagan ways were dead. He had to consider the new upcoming spiritual forces of Christianlity and his decision was backing the trinitarian groups in their powerstruggle against the other believers. Enforcing a political-spiritual consensus where everybody would have to find something of himself in it. Enforced by the sword and power of the State under his authority. With the dividing of the Empire between East and West, the Church in Rome saw the opportunity to break free from the Church authority of Byzantium, supporting the western Emperor. It meant the beginning of Western history. I think Christian Orthodoxy has a good point in saying there is a spiritual foundation for the continuous (slow) deviation of the Western Church. If this is true, it would mean we can expect a same evolution in Protestant Churches also and even within time maybe a fusion between different Churches under Rome again, because the root of the deviation would be the same. I agree it will result in a uniform culture in the West (what political Europe needs and seeks), counterbiblical, and it could give way to a time of persecution for real believers. But this will be rationalized and empowered by the many cults we see today. Persecuting cults (for protecting people) can be the trigger or the excuse for the coming persecution. We may conclude — if this analysis is true — that we will testify the end of the relevance of the Church, as the Book of the Apocalypse reveals there is no Church there. For HaShem the Church on the long term does not play any role in His story of salvation. My position is that the root error in both Eastern Orthodoxy and Roman Catholicism is Replacement Theology, and that major theological, christological, and ecclesiological errors are strongly connected to this root error. As to the development of the Papacy, I would say that the Western Church showed a stronger emphasis on a closed juridical and hierarchical system of authority and a stronger sense of logic. The point here is not that this logic was wrong but that it was applied to the wrong entity, namely the Roman Church instead of the Jewish Nation. If the Church is part of Israel, it cannot have a functional hierarchy in the form of a priesthood which is independent of Israel and its national restoration. The ‘priesthood’ of the Assembly of Messiah can only exist as the leadership of Overseers, Elders, Deacons, &c, which are part of the basically synagogal structure of the Assembly, in a spiritual participation of the Melchizekian and heavenly Priesthood of Messiah. These offices in the Assembly can be exercised here on earth only on the synagogal level, not on the level of the official Levitical Priesthood of the Temple, which will be restored in the Kingdom Age. So the Papal Church is essentially wrong in considering its hierarchy to be the legitimate successors of the Sanhedrin and the Levitical Priesthood. But it is correct in its logic of the necessity of a hierarchical leadership of the people of G’d. In a similar way I consider the theology and philosophy of Thomas Aquinas, with its sharp analytical distinctions and its demarcation between the domains of natural knowledge and divine revelation, an enormous progress when compared to the work of many Church fathers, including such geniuses as Augustine for example. Aquinas’ effect on Catholicism is comparable to that of Maimonides on Judaism. But while Maimonides’ basic strength was was in the new scholastic analysis of the Torah, Aquinas’ forte was philosophy proper. And while Maimonides made some philosphical errors leading to rationalistic pitfalls which had bad effects on parts of his theology, in Aquinas the defect was in his theological assumptions which sometimes did damage to his philosophical acumen. The Protestant Reformation was successful in breaking the power of the Papacy and the Roman Church. In a new atmosphere of freedom it cleared up some of the superstitions that had crept into the Church, and brought a new devotion to biblical studies. But it hugely suffered from a neglect of philosophy, theological systematics, and the ancient aristocratic culture of the liturgy. One of the misfortunes of the modern messianic movement is that it inherited these defects of the Reformation in an engrossed form, through the intermediate stage of popular evangelical culture and theology.